Are there any good 1060 aluminum coil suppliers in China? 1060 aluminum coil with aluminum content of up to 99.6%, also known as pure aluminum , it is pretty similar to 1050 aluminum alloy with more than 0.1% of aluminum by weight. but they cover different ASTM standards. 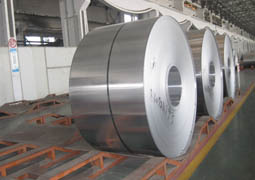 1060 aluminum coil contains 0.05% cooper, thus, its conductivity is 55%. Besides, 1060 aluminum coil is relatively low strength, essentially pure aluminum alloy with many different tempers, such as O (annealed), H12, H14, H16, H18, etc. what’s more, other aluminum coil belonging to commercial pure wrought family are available, including 1050, 1070, 1100 and so on and so forth. 1060 aluminum coil has a good elongation and tensile strength, fully able to meet the requirements of conventional processing (stamping, stretching) high formability (1060). 1060 Aluminum industry pure Aluminum coil , high plasticity, corrosion resistance, electrical conductivity and thermal conductivity, but the intensity is low, heat treatment can not enhance machinability is not good; can welding, welding and welding with hydrogen atoms, is not easy to bear all kinds of pressure brazing; processing and drawing, bending. We would like to highlight our aluminium coil,aluminum sheet coil,embossed aluminium coil and aluminum tread coil with good quality and competitive price.. Haomei Aluminum sells its products widely to United State, Brazil, Chile, Mexico, Germany, UK, Italy, Bulgaria, Czech, Saudi Arabia, UAE, Iran, Bangladesh, India, Sri Lanka, Vietnam, Japan, Korea, Singapore, Indonesia, Philippines, Austria, Fiji, South Africa etc more than 40 countries. Haomei Aluminum has total annual production capacity of 200,000 metric ton aluminum coil,sheet, strip and foil. It is equipped with 1+4 hot tandem rolling line, 4 cold mill production lines, and 5 foil mill production lines, and a complete complex of fishing equipment..
← Why is mirror finish aluminum sheet metal used as cell phone shell?